Pannell Discussions » 206 – Award for Pannell Discussions » Ideas in economics, environment, policy and more. I mentioned in PD#200 that, to mark the milestone of reaching 200 posts, I was nominating Pannell Discussions for an award. 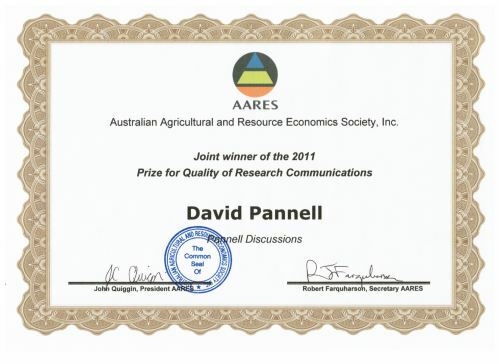 The award was the “Quality of Research Communication” prize of the Australian Agricultural and Resource Economics Society (AARES). The results were announced last week at the AARES national conference in Perth and, happily, the nomination was successful (as a joint winner). I’d particularly like to thank readers who have in the past sent me nice emails about one Pannell Discussion or another. I quoted a number of these emails in the nomination. Posted on 13 February, 2012 by David Pannell. This entry was posted in Latest.